We bought our Mack motorhome in August 2010 to live in and to explore New Zealand, leisurely as we work. We are currently in Tauranga having spent a year in Invercargill after leaving Whangarei Jan 2011. It's almost two years again and the blog has been parked up for a while. The motivation for the last entries came from the completion of a couple of books and as an update, there was a fourth. This one was about the trucking in USA and took considerably more time and effort to produce. However, once again it was really satisfying to have it completed and shelved with the others. To read on a rainy day perhaps. Time passes quickly when you stop taking notice and for the last two years we've been occupied with heading away either cycling or hiking somewhere within weekend distance of Tauranga. We upgraded our camper van last year and 'Fries', our Mitsubishi Fuso camper has made it so much easier to head away, sometimes on a Friday evening and sometimes early Saturday. The cycling, although still very enjoyable, took a bit of a dive after a couple of injuries and as a result we started to spend more time in walking boots. Needless to say, the appeal of the bush trails, particularly around the Kaimai Ranges has sparked an interest in seeing more of NZ by foot. Earlier this year we walked the Heaphy track taking 5 days and making good use of the wonderful DOC huts along the way. 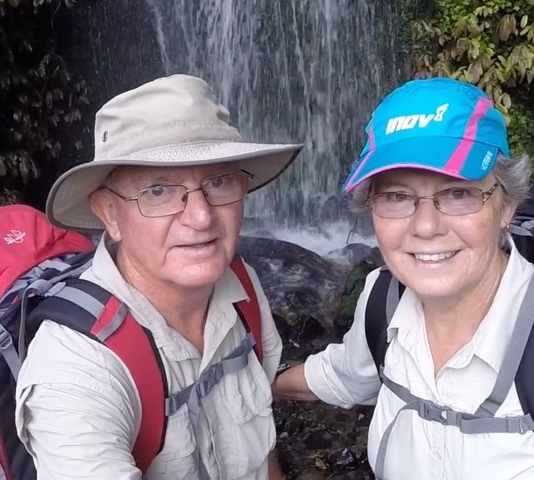 Despite being a bit foot sore by the end of the trail we were still keen to pursue an idea that had been hatching for the last year and that is to tackle the Te Araroa trail, a continuous 3000 km walking trail and the ultimate 5 month NZ great walk. You must be mad, some say. Maybe they are right but our current plan, based on plenty of consideration and planning, is to complete the Te Araroa trail this summer coming. I have been lucky enough to get 6 months leave without pay (they wouldn't pay me to go) and we will start 'the long walk' in early October from Cape Reinga with the goal of finishing in Bluff in March 2017. My thoughts are to keep a Facebook page and I'm not sure about using this blog also to record the trip but will listen to any feedback. We have the added advantage of friends Kath and Peter keeping within close proximity to us in their camper van while we are walking so we expect that they will be able to meet up with us periodically, listen to our grizzles and send son our way again. Having them handy will help where there are harbour and river crossings as they will hopefully give us a ride and we also think that we will cycle some of the road sections. With less than 100 days to go the excitement grows and so watch this space or Facebook to hear how we get along. We started this lifestyle in August 2010 having sold our small acerage in Kamo. We have previously lived aboard a 35 foot yacht, Scot Free, sailed among the South Pacific islands of Tonga, Fiji, Vanuatu and New Caledonia. We have travelled extensively through the USA and Australia and now set out to see NZ in a leisurely and comfortable way.